The Oven Cleaning Solution for All Appliances. Built-In, Cooker and Microwave oven cleaning. Our highly specialised deep cleaning system or valeting as we refer to our service, is the perfect solution to restore all makes and models including hotplates, extractor hoods and microwave ovens. We refer to domestic ovens and microwaves that are integrated into cupboards as ‘built-in’. These items will typically have one door or two and our technician will ask you on the phone to explain what appliances you have in the kitchen and which will need our expert attention. Many one and two door built-in appliances are at eye-level however an increasing number are cleverly utilising space under the worktop but are still built-into the cupboard. If your oven is ‘built-in’ there will generally be a separate hotplate that sits in the worktop. Our system and products will produce superb results on all hotplate types including gas, electric, ceramic and halogen. We’ll be delighted to include the hotplate in an all inclusive quotation. 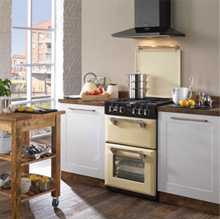 Traditional cookers and ovens that sit directly on the kitchen floor are classed as ‘Freestanding’. Although these appliances are often fitted neatly between two kitchen units, they are not actually built into the units themselves and could, if needs be, be pulled forwards. All ‘Free-Standing’ ovens and cookers have the hotplate as an integral feature and they will also either have an eye-level grill, a separate grill door or a grill element in the top of the main/secondary oven. Our unique and environmentally friendly products are also designed to clean microwave ovens beautifully. We have the technical expertise to cope with all makes and models whether a ‘standard’ microwave or a ‘combination’ microwave oven/grill. 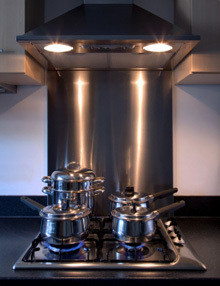 Above most hotplates and/or ‘free-standing’ cookers and ovens there will be an extractor hood. Designed to extract or re-circulate, extractor hoods by their very nature will eventually need a thorough deep clean and perhaps a filter replacement to keep them working at maximum efficiency. Perhaps it would be worth asking your local expert for their opinion on the condition of your extractor either on the phone or whilst there at your home? In all cases, our experts will help you to explain exactly which type of appliances you have so that your all inclusive quotation is accurate and will also ensure that sufficient time is allocated to produce the outstanding results we know you’ll expect. We look forward to your call on 0800 580123 or your e-mail enquiry. 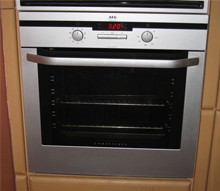 Or read more online about our domestic oven cleaning service.